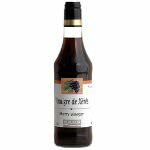 Banyuls Wine Vinegar is also called Natural Sweet Wine Vinegar. It is made from a fortified wine of Banyuls, in which residual sugars have been retained by adding neutral grape alcohol to stop the fermentation of the wine, hence the name natural sweet wine. This Banyuls of high quality is aged for 4 years in wood vats which are outdoors exposed to the climatic variations. This type of aging gives a wine with a burnt topaz robe and a woody and spicy nose, and it develops an aroma of fresh walnut and mint which you will also find in the vinegar. 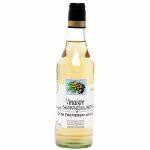 The vinegar is aged in oak barrels for one year in a storehouse of the vinegar factory. The color of the vinegar is luminous amber, it has a bouquet of intense notes of walnut, gingerbread, bee wax, vanilla and liquorice and it tastes of fresh walnut and mint. Banyuls Wine Vinegar is wonderful in marinades, it adds character to sauces, and it spices up dressings and deglazing. Ingredients: 100% banyuls wine vinegar.